Four Seas International House, a buffet restaurant popular in Shenzhen and Guangzhou, has found itself in hot water after a video filmed by an undercover Shenzhen TV reporter emerged showing unsanitary kitchen conditions and staff behavior that would make any seasoned restaurateur cringe. The clandestine reporter got into the kitchen of the Yitian Holiday Plaza location of Four Seas International House after pretending to be looking for employment. 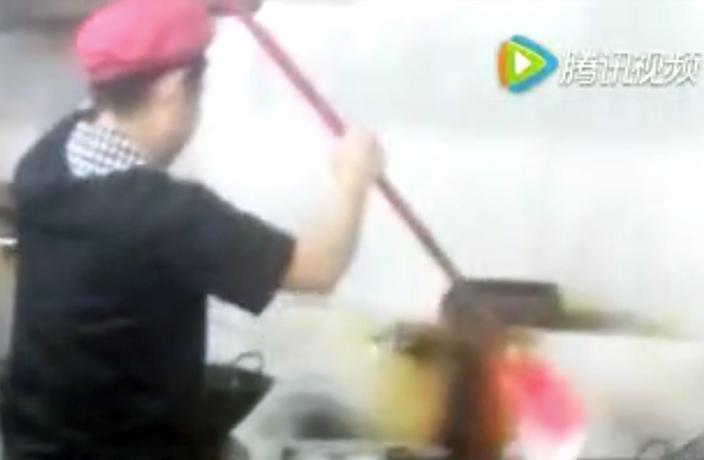 After being recruited by the restaurant, the journalist filmed a gut-churning six-minute video that shows employees using their bare hands to check food temperature, a dirty broom to clean cooking utensils and fake shark fins (pictured below), among other ghastly discoveries. At one point the undercover investigator is told by a kitchen worker that dead oysters are barbecued and garnished with garlic and chilies before being served to people – that way customers won’t know the shellfish has gone bad. “The worst outcome is they [customers] may suffer from food poisoning, but a little bit of dead oysters won’t claim their lives,” a Four Seas worker tells the reporter in the video. Naturally, the video footage has gone viral in Shenzhen, with many netizens voicing their misgivings about food safety in the city’s countless restaurants. The footage has lead to a government investigation into the restaurant.